With way more than 5,500 breweries operating across the country, distribution news is always a steady constant in the CBB mailbox. Every week, we get virtual piles of announcements on new alliances, upcoming state expansions and even reductions from breweries growing and shrinking their distribution footprints. Here is some of that wholesaler news. Enjoy! Brown Bag Beverage, one of the fastest growing craft beer distributors in the greater San Diego area, added yet another great craft beer company to its portfolio, Hopworks Urban Brewing (HUB) from Portland. Brown Bag Beverage will be distributing some of HUB’s most popular beers such as the HUB Organic Pilsner, Hopworks Organic IPA and Patagonia Long Root Pale along with five of their most popular canned brews. Hopworks Urban Brewery (HUB), Portland’s first Eco-Brewpub launched their beer to the world in March 2008. The 20-barrel brewery produces 13,500 barrels of beer and cider annually offering an assortment of award-winning, world-class beers made from organic malts and hops in cans, bottles and on draft across the Pacific Northwest. HUB boasts the mission to continue to revolutionize and inspire the brewing industry with practices that drive quality, protect the environment, and improve the communities we live in. We believe it is the perfect addition to the San Diego Beer scene. 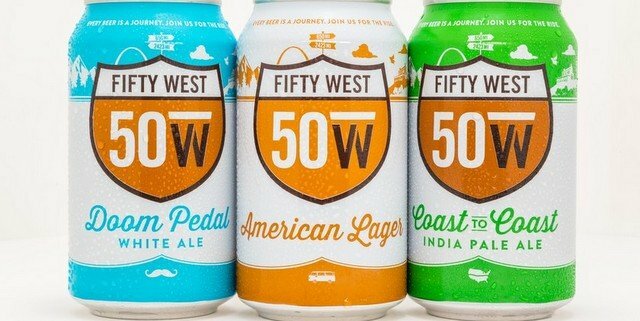 Fifty West Brewing Co. reached an agreement with Stagnaro Distributing to handle distribution for Cincinnati and Northern Kentucky. The partnership which will cover Hamilton, Clermont, Brown, Highland, and Adams County in Ohio and 12 counties in Northern Kentucky, goes into effect Oct. 23. Fifty West has been self-distributing since its inception in 2012, and built itself into the third best-selling local brewery in the Cincinnati market, despite only being available for purchase on draft. The award-winning brewery has recently formed partnerships with major retailers in the Greater Cincinnati area and plans to make cans available in the first quarter of 2018. Fifty West is scheduled to launch with Stagnaro in the Kentucky market starting Oct. 30. In conjunction with the distribution expansion Fifty West announced the addition of Del Hall as the new director of sales for Fifty West. Hall served at Premium Beverage as sales manager for southern Ohio. Max Fram who previously held the title of director of sales has been promoted to vice president of strategy and operations. Fifty West expects to add close to 30 jobs over the next 18 months as they prepare to fulfill the increased volume demands created by availability of cans along with expansion into the Dayton market later this year. Pikes Peak Brewing Co.’s beer will soon be available in California. In its ﬁrst out-of-state distribution, Pikes Peak Brewing will launch with its popular Gold, a Belgian Golden Strong, Elephant Rock IPA, Devils Head Red and newly released seasonal IPA, 38 Faces. 38 Faces is currently a blood orange IPA. Along with select seasonal releases throughout the year, these beers will be offered in six-packs of 12-ounce cans. “California has a great population of craft beer fans and we are very excited to bring a taste of Colorado to the Golden State,” said Chris Wright, founder and head brewer. Pikes Peak Brewing’s beers will be distributed through Alta Marketing Co. in Redlands, Calif. The beer will be available and featured at all BevMo! stores throughout the state. Headquartered in Concord, Calif., BevMo! is California’s premier specialty beverage retailer. It currently operates 146 stores throughout California. “We are excited to be the ﬁrst to bring Pikes Peak Brewing’s quality beers to the California craft beer community.” said Brian Bowden, VP of beer at BevMo! The beers will be available to consumers by mid-November. Pikes Peak Brewing is planning several “meet the brewer” events in various BevMo! locations to connect Californians with the brewer. Local Maine companies Nappi Distributors and Central Distributors signed an agreement to begin distributing Portland-based Lone Pine Brewing Co. beer sometime around the beginning of 2018. Lone Pine also announced the agreement to purchase Sebago Brewing Co.’s current 13,000-square-foot installed brewery in Gorham. The additional brewing equipment, packaging and warehouse space included in the sale will quadruple the size of the young brewery from 5-barrel to 20-barrel capacity. Sebago will move its operations to a new brewing space in Gorham which is scheduled to open in mid-February. Lone Pine, which started brewing at its Anderson Street location in March 2016, is already brewing its well-known Portland Pale Ale at the new location. Co-owners Tom Madden and John Paul will keep the tasting room location in Portland open and plan to enhance the draft list there, using the location as more experimental space. Nappi Distributors, of Gorham, will service the southern part of the state, including Cumberland and York Counties. Central’s distribution territory will encompass areas north, including Topsham, Lewiston, Oxford, Augusta, Bangor and Presque Isle.